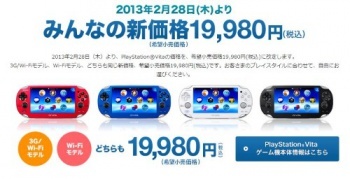 The Japan-exclusive discount reduces the handheld's price on Wifi and 3G models by up to a third. As of late, Sony has offered conservative sales forecasts for its struggling PS Vita, which has seen demand in Japan taper off after release, with even the hardy PSP outselling the device at times. In an attempt to drive demand, Sony has announced price drops of up to 33% on the handheld device for Japanese consumers. An official online video press release announced that both the 3G and Wifi-only model will cost 19,980 yen (or about $215) from February 28th. This is down from the Wifi model's original price of 24,980 yen ($265) and the 3G's former price tag of 30,000 yen ($320). Unfortunately, no price cuts have been announced for the rest of the world just yet: an SCE spokesperson says that the promotion "is for the SCE Japan region only". A number of promotional campaigns are running in conjunction with the price drop. Japanese Vita owners will receive a free week of PlayStation Plus with their purchase, and new member registrations for Sony's "Reader Store" will receive bonus Sony Points to spend on eBooks and digital manga. In addition, the PS Vita's "Torne" service, used for TV watching and recording, will be running a free download campaign until March 13th. A new color scheme called "Ice Silver" is also being debuted, packaged with a copy of Phantasy Star Online 2. Sony has consistently lowered its sales predications on the handheld, claiming the device's "slow penetration" of the hardware market. It aims to move 7 million handhelds by March 31; whether these discounts will help the company reach that target remains to be seen.